Sunwolves flanker Ed Quirk after being sent off on Friday night. The chance of hearing anything from "Andy Who?" is remote, even after the call of pedantic Kiwi referee Ben O'Keeffe that has been condemned worldwide. 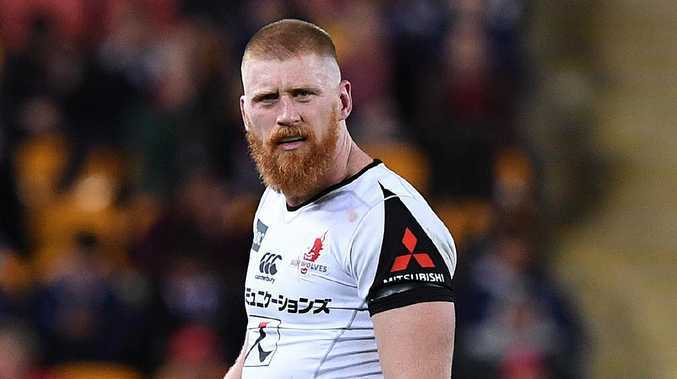 The official charge for Sunwolves flanker Quirk is "physical abuse" for leaning a tame, closed right fist on the cheek of Reds fly half Hamish Stewart from one centimetre away at the bottom of a ruck last Friday night. A video-conference hook-up at 5pm on Sunday should expedite this fizzer, but Reds flanker Caleb Timu has far more to worry about after being cited for a reckless shoulder-and-head torpedo when trying to dislodge Hayden Parker from the ball on the ground. "I've spoken to a lot of old players … the game's gone soft because you make a good, proper hit and you get a red card for it too," No.8 Britz said. 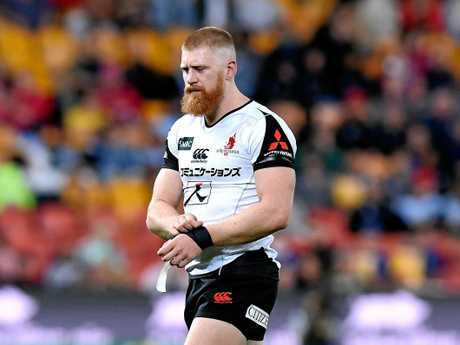 Sunwolves coach Brown, the former All Black, was dismayed at O'Keeffe's flawed on-field reasoning that he had "no other choice" with the clenched Quirk fist. "The refs are almost looking to be in the media, being the guy that does it," Brown said.
" 'I've got no other option' … what a load of crap. It's just embarrassing." Thorn's Queensland side has been guilty of poor tackling technique at times but not at the level of punishment dealt them. Most of the 10 yellow cards, and Scott Higginbotham's red card, have been for tackling offences. "I'm the opposition coach and I'm saying this is no good. Seriously, man, it's hurting the game," Thorn said after the Quirk call. "A loose forward (Quirk) gives a five-eighth a little facial … isn't that what you are supposed to do? "My sons do it in the backyard and it's beautiful. 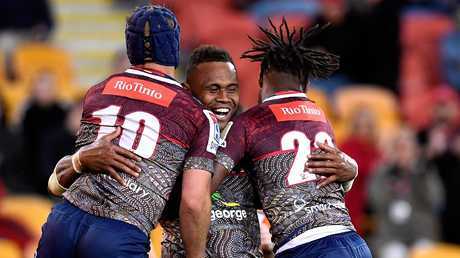 Eto Nabuli of the Reds is congratulated by teammates Hamish Stewart (left) and Moses Sorovi after scoring against the Sunwolves on Friday night. "I suspect I sound like a relic saying 'back in the day blah blah', but seriously this (with too many video review stoppages) is not good for footy." "Every rugby player who has ever played the game is looking at that and saying it's not a red card," Brown said. "I'm worried, 100 per cent (where refereeing is heading). It has just got bizarre. "To me, the (Timu) yellow card where he's trying to kill a guy on the ground with his head and shoulders is quite dangerous, not a (Quirk) closed fist that was not even a punch."